Enter for a Chance to Win a Copy of SALT, FAT, ACID, HEAT! This sweepstakes has ended. Sign up for the Tips on Life & Love newsletter to stay updated on all of our future sweepstakes! 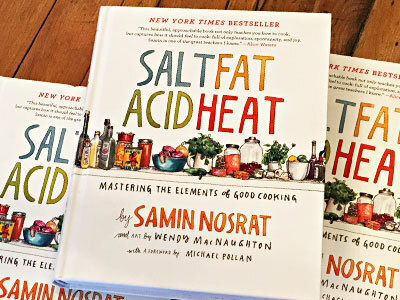 That’s right: FIVE lucky winners will each receive a copy of the essential cookbook SALT, FAT, ACID, HEAT by Samin Nosrat, with art by Wendy McNaughton! Click here to enter for your chance to win the cookbook that inspired the Netflix show! NO PURCHASE NECESSARY TO ENTER/WIN. Sweepstakes begins at 12:00 a.m. ET on October 19, 2018 and ends at 11:59 p.m. ET on October 28, 2018. Open to legal residents of any 1 of the 50 United States and the District of Columbia who are at least 18 years old. Void where prohibited by law. Subject to full Official Rules. Total approximate retail value of all prizes combined: $175.00. © 2018 Simon & Schuster, Inc., A CBS Company. All Rights Reserved. Share Enter for a Chance to Win a Copy of SALT, FAT, ACID, HEAT!